Sangiovese Grosso, Sangiovese Piccolo, Sangioveto ….. is to name just a few of the aliases for this grape and its closely related cultivars; providing the core body for most Tuscan red wine recipes, and still reigning as the most consumed Italian wine style at home and abroad. Dark blue-skinned Sangiovese takes its name from the Latin term, Sanguis Jovis (‘blood of Jove’); an exalted reference to both the elixir’s colour and its place in Europe’s pantheon of great grape species: Vitis Vinifera. It’s also the most widely cultivated variety in central Italy, with prolific vineyards in Lazio, Umbria, Marche and Tuscany combining for 95% of worldwide plantings, which is a largely unrivaled dominance by a major grape, sourced from a single country. Over several hundred years, generations of growers have steadily built up their expertise with ‘San-joh-vay-say.’ Stewarding these slow ripening fruit clusters through to a balanced maturity is an agricultural art that Tuscans have diligently become very, very good at! In the vinicultural history of many old world regions, the development of a distinctive wine style that becomes immensely popular, aided by prodigious yields of grapes that are well-suited to the terroir, adds up to a mixed record of glory times and a fair share of winemaking folly. The sometimes too-voluminous output of Tuscany’s Chianti is no exception to the latter. Happily, the decades in the mid-20th century during which large commercial producers let loose far too much unremarkable bulk wine dressed up in attractively rotund flasks swaddled with woven straw called Fiascoes, are long gone. In the 21st century, a re-invigoration of a different sort has taken hold in the baseline winemaking practices of these lands and culture that were the birthplace of the Italian Renaissance. This time, Tuscan vintners are focused on advancing the competitive quality across all grades of their wine; from everyday offerings such as charmingly simple Chianti through to premium production of Vino Nobile di Montepulciano and Brunello. At the core of this shift is the general reduction of harvest yields by the growers who themselves were instrumental in redefining the mandated guidelines of Italy’s highest classification of quality: DOCG (Denominazione di Origine Controllata e Garantita). 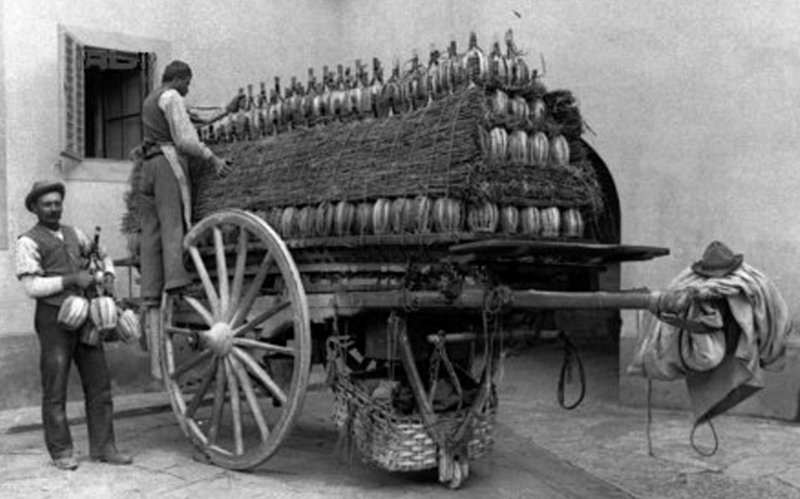 Now favouring the cultivation of higher quality grapes over the indiscriminate volumes of fruit they were once encouraged to output by the region’s factory-style bottlers, the visionary initiatives have resulted in both commercial and reputational success. Too bad about the demise of the traditional straw wrapping, though, it was so rustically emblematic of Italian table wine for such a long time! Drawing on over 400 hectares of vineyards throughout the provinces of Grosseto, Florence, and Sienna, the cooperative growers allied with Cantina Viticoltori Senesi Aretini are focused on value-driven wines fashioned from the region’s indigenous grapes. 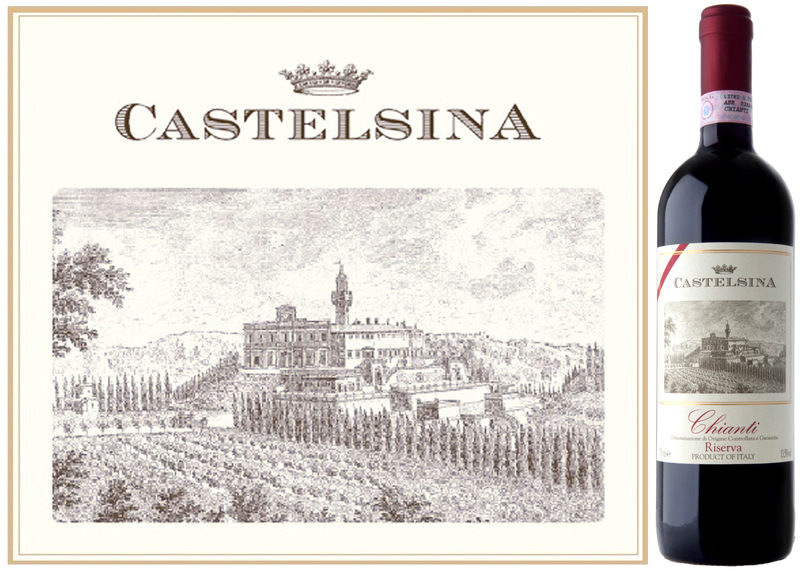 This DéClassé feature of Castelsina Chianti Riserva is a non-estate, well-crafted everyday wine that’s a limited release from the banner 2010 vintage. Despite its fictitious branding (unlike Castellina there is no such place as ‘Castelsina’), this is nonetheless a delightful, medium-bodied Chianti, displaying an integrated character of vibrant fruit blended in among the savoury earth notes. Exercising restraint in the finishing process of wine demonstrates some modern winemaking wisdom. In the case of this bottling, the straightforward recipe of 80% Sangiovese fermented in Inox tanks before spending the 12 months in oak, results in an unfettered and refreshing offering that’s true to its pedigree. Add a $14.95 price-point, and you have a winner that will sell swiftly. I would buy many, to fill the empty slots in your loose-straw-lined storage boxes. The success of this offering will probably prompt a price increase for the next vintage! This medium-bodied Chianti demonstrates the expected combination of plum and cherry flavours and aromas blending with a restrained earthiness and the spice notes gained from its aging in oak. Try serving as an apéritif with salty charcuterie and cheeses such as Pecorino or with heartier fare such as roast lamb with rosemary, rib eye steak with asparagus and a mushroom risotto or Tuscan-style sausages and Fava beans. Despite having been quietly tucked away in the autonomous province of Castilla y León for centuries, the Bierzo DO region is re-emerging at the forefront of modern Spanish winemaking frontiers — as a reliable source of regionally distinctive, high-quality wines. What’s far more longstanding than this newly minted status are the region’s Roman-era gold mines, Templar Castles, and a host of medieval monasteries serving as way stations on the famed pilgrimage path, Camino de Santiago. Geographically acting as a funnel into the verdant northwest corner of the Iberian peninsula, the various valleys of El Bierzo make up the upper basin of the Sil River system whose waters are fed by runoff from the Montes de León and the Cordillera Cantábrica mountain ranges. Aptly referred to as the ‘gateway to Galicia,’ which in turn is characterized as ‘green Spain,’ the fertile and rumpled territory of Bierzo marks the bountiful transition zone. Though still a relatively small and less-well-known Spanish region in the international wine market, Bierzo’s rising reputation for winemaking is fueled by a unique climate of Atlantic and Mediterranean influences that moderate each other’s extremes; making for conditions where both red and white wine grapes thrive. Capitalizing on this natural blessing, the 55 major Bodegas of Bierzo are impressively outputting 11 million liters of wine annually, and with the optimistic trend by local vintners of rehabilitating their older, under-producing plots, the vineyard expansion continues at a healthy/sustainable pace. 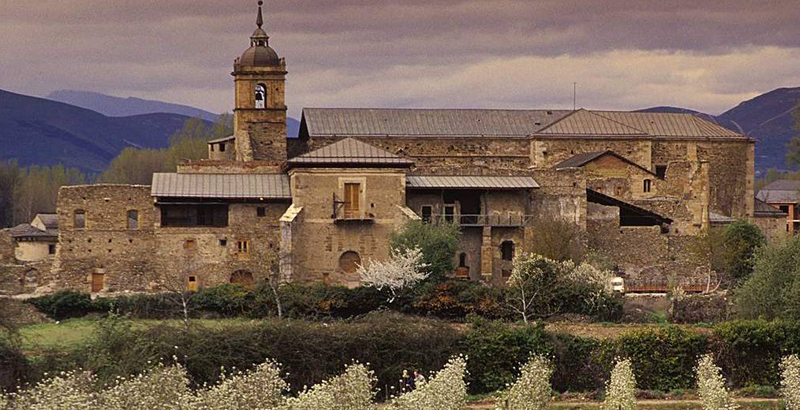 Though taking the inspiration for its name from the inactive, neighbouring abbey of Monasterio de Santa María de Carracedo that dates to the 10th century, Bodega del Abad (‘the Abbot’s Cellar’) only became active as an independent producer in 2003. Initially developed under the guidance of a legendary winemaking master, José Luís Santín-Vázquez, the Bodega already boasts a loyal following that was engendered by a surprising release of a 2001 Crianza-grade cache of their earliest vintage; one which had been hiding somewhere in the dark back corners of their cellars. This week’s DéClassé feature of Abad Dom Bueno Crianza 2006 is also a surprising re-release that’s being offered for a 4th consecutive year. Evidently, the current vintner, Miguel Tienda Baena, has exercised discretion in evaluating the character of this particular vintage; one that’s been settling for eleven years now. Unsurprisingly, it’s evolved into a soft and rounded bottling, but surprisingly, still possesses some fruitful vigour, mineral streaks, and a reasonable level of enlivening acidity. These balanced attributes point to many factors of winemaking accomplishment while bringing to bear modern production techniques, but also revealing the innate potential of Mencia. 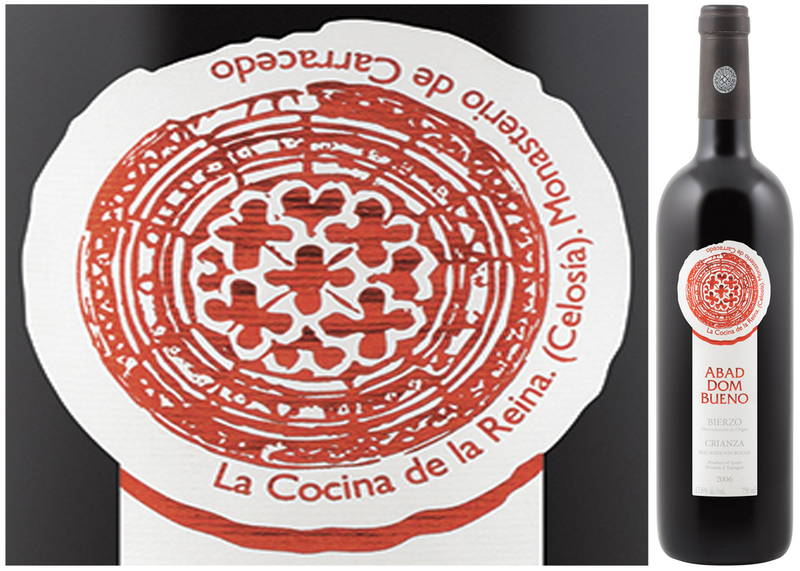 Indigenous to Bierzo, and with a significant increase in plantings since the 1990’s, the rising star variety has joined the list of the four most important Spanish red wine grapes: Tempranillo, Garnacha, and Monastrell. Producing compact grape clusters of medium-sized, violet-blue berries, its renaissance of popularity has been bolstered by an ability to yield age-worthy wine at relatively modest price points. 35 hectares of this bodega’s vineyards are located up on steep terrain made up of slate and quartzite-laden soils where the mix of old vines, with some approaching 70 years-of-age, continue to yield characterful fruit. When meticulously handpicked and sorted as they are at Bodega Del Abad, the harvests are creating wines that are characteristically fleshy, velvety, and bursting with red berry flavours. This bottling is certainly ready to please now, and as it’s a yearly favourite for LCBO Vintages customers, it will evaporate from the shelves quickly as the word of this gem’s reappearance spreads. If you’re not an optimist when it comes to storing wine, then just buy enough to get you through the upcoming spring, summer, and Fall! Though gracefully aged, this still offers juicy red cherry and currant flavours with subtle herb, vanilla and chocolate accents. A refreshing acidity enhances the core of soft tannins, so it could stand to be slightly chilled before decanting. Try serving with rich poultry dishes such as blackened Cajun chicken, a roasted leg of herbed lamb, Balsamic and ginger marinated steak or with spicy beef empanadas. As of 1956, the 4th generation vintner, Michele Chiarlo, has been at the forefront of innovation and the significant elevation of wine quality in Piemonte; particularly with Barbera, Barbaresco, and Barolo. Aside of this cadre of fleshy red wines, the region also excels in some less-well-known, white wine styles with a brightly acidic character such as Moscato and this DéClassé recommended Gavi. Now with an official designation of origin, Italy’s Gavi DOCG encompasses 13 communes in the province of Alessandria whose winemakers benefit from a regional micro-climate; one that’s highly conducive to early ripening grapes like Cortese; one of the few varieties that can be successfully cultivated both as a wine and table grape. Within its diversity of vineyards that are dotted about southeastern Piemonte (‘ai piede della montagne’ – ‘at the foot of mountains’), the Chiarlo vintners continue to explore the potential and meet the challenges in managing both red and white grape-growing terroirs. Particularly helpful for this balancing act of viticulture is the convergence of weather systems that are influenced by the Apennine Mountains, and an arm of the Mediterranean called the Ligurian Sea. The sufficiently long summer coaxes ripeness into the red Nebbiolo fruit, and as the plentiful heat gives way to nebbia (fog) shrouded harvest seasons, the desirable crispness of white Cortese is maintained. 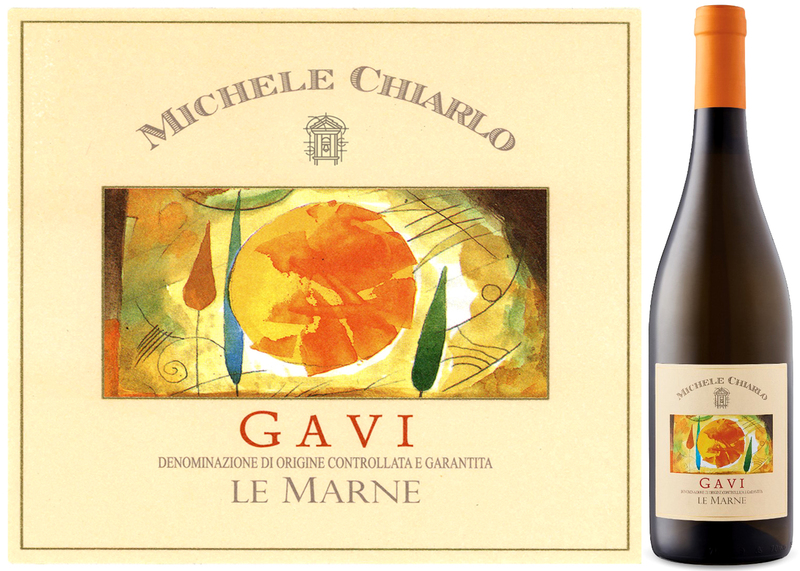 For this week’s featured, Michele Chiarlo Le Marne Gavi 2015, the unique nature of the soil provides a meaningful namesake: Le Marne – a reference to the calcium-rich marl with volcanic deposits. Already blessed with the natural beauty of its surroundings, Orme Su La Court (‘Footsteps in La Court’) is another remarkable aspect of this winery. It’s a vineyard art walk that expresses the influences of the four elements: Earth, Air, Water, and Fire. Designed in collaboration with the late Genovese artist, Emanuele Luzzati, sculpture installations have been integrated into the long rows of vines that wend their way across the rolling hills of the La Court estate. One of many notable features is the group of ceramic heads on poles called ‘Le Teste Segnapalo.’ These are a reinterpretation of the traditional farming practice whereby figureheads are placed in the landscape to ward away negative influences on the growth of the grapes. For the most part, the ever-expanding installations intend to create meditative spaces, viewpoints, and playful accents on a walk that begins and ends at a cluster of farm houses. 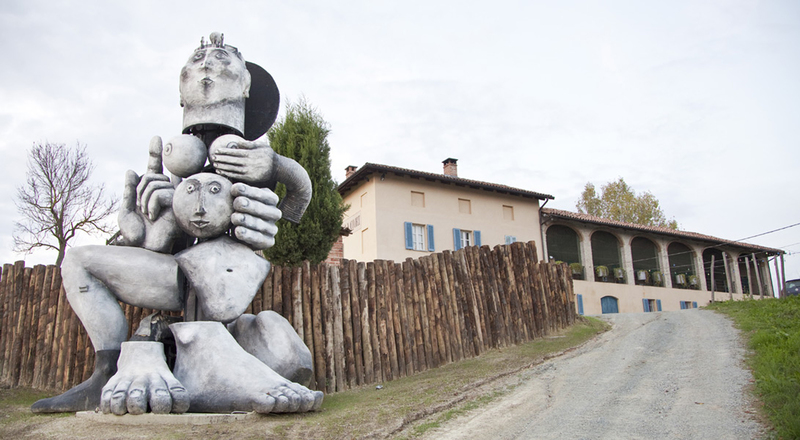 Here, the curated exhibits, screenings, and musical performances offer visitors the opportunity to further mix an appreciation of the wines with the creativity and range of the Piedmontese arts. The North American market is still slow in appreciating a fuller range of Italy’s dry white wine catalog other than ubiquitous Pinot Grigio and Soave; arguably, some of the least distinctive of their exported offerings. Dare to consider adding this Gavi to your evolving contingent of alternative and more interesting choices such as Friulano, Vermentino, Lugana, and Pecorino. Available in the LCBO Vintages section, the limited stock of this seasonal release won’t be on shelves for very long – but will hold up well in your cellar for at least the remainder of this year. This firmly structured, dry white wine has many of the characteristics typical of the Cortese grape including delicate notes of honeydew, apple, vanilla, and a touch of minerality. Apart from being a pleasing apéritif wine when served alongside antipasti, it’s also complementary to main courses of grilled fish, stuffed trout, light cream-based pasta or pesto dishes, roast pork, or vegetable and cheese ravioli.